Balaia residence is a privately owned condominium build to an excellent standard, with electric gated access and video telecom. Our 2 bedroom house benefits from 3 terraced areas, outside brick build BBQ and sink, private front garden leading onto beautiful large gardens, swimming pool with a separate children's pool. There is a child's play area situated away from the main pool and gardens. The front terraces and the bedroom terrace are south facing, so get the sun from early morning to late afternoon. The house has air-conditioning, electric shutters, a contemporary design throughout. Ideally placed for golf, restaurants, shops and the 5 star spa resort. This is a small relaxing complex with only a very few available for holiday lettings. Bathroom with bath, w/c, bidet and shower. Ground Floor wc and sink. We also provide Beach Towels. Large lounge and dining room with 2 leather sofas, 32' flat screen, Sky TV, DVD player and CD player. Dining table and 6 chairs. Electric shutters. Now with Wi-Fi and SKY TV. Fully equipped kitchen with cooker, hob, fridge/freezer, microwave, dishwasher, toaster and kettle. Electric shutter. Balaia Golf Village 2 mins walk, 9 hole. Salgados, west of Albufeira, 5km, 18 hole. Pestana Golf, Carvoeiro, 20 mins 18 hole. Sheraton Pine Cliffs, Albufeira, 5 mins, 18 hole. Vilamoura old courses, 15 mins, 18 hole. Vilamoura Lagune, 15 mins, 18 hole. Vilamoura Millenium, 15 mins, 18 hole. Vilamoura Victoria, 15 mins, 18 hole. Vilamoura Pinhal, 15 mins, 18 hole. Pinheiros Altos, Qunita da Logo, 25 mins, 18 hole. Villa Sol, Vilamoura, 15 mins, 27 hole. Qunita da Logo north, 25 mins, 36 hole. Qunita da Logo south 25 mins, 38 hole. San Lorenzo, Quinta da Logo, 25 mins. Vale do Lobo, 25 mins. Notes on accommodation: On arrival you will be greeted by our property manager who is English and will be happy to arrange car hire, welcome packs and answer any questions that you may have. Cots and car seats can also be arranged. Beach towels are included. No pets. We kindly request that you do not smoke in the house, but are welcome to smoke on the terraces. We can also arrange transfers to and from the airport. We also have Wi-Fi. Outside: Large 18m x 12m shared pool with a separate 12m x 4m children's pool, set in large beautiful landscaped gardens. Also sand and children's play area with slide, swings etc situated away from the main pool and gardens. Our house has ground floor terrace area with a large dining table and 6 chairs, 4 sun loungers, brick build BBQ and outside sink leading onto our private garden. There is also a front bedroom terrace and rear upstairs terrace. Secure private parking, video telecom entry system with electric gates. Utility Room: Washing machine, ironing board, iron, hoover and clothes airer. Cleaning / Towels / Linen / Maid service: Stays of 1 week/less than 1 week, include only end of stay laundry and cleaning. Stays of min 2 weeks include weekly laundry, towel change and cleaning. Linen & beach towels provided. This was our 4th or 5th time back and yet again it didn't let down.... The house is fab, has everything you need for a great relaxing holiday. The redesign of the new balcony garden is wonderful, we made very good use of it every evening for dinner and watching sun go down. Pool and gardens are alwAys quiet enough that you feel you have it all to yourself. This house is a def must for anybody looking for a great relaxing getaway! Credit also to Simon and Marie (who manage it locally) for their help with anything and everything! We much prefer to have a car when staying here but there are enough shops etc locally to manage if not. Locally beach is fab too. Would never hesitate to return for another great break. Perfect apartment with all that you need for a relaxing holiday. Well equipped, only 5 - 10 mins away from the restaurants, beach and supermarket. On the nights we didn't eat out, we would make use of the BBQ out on the patio. The beach was clean and not over crowded but plenty of water sports available plus sunbeds and parasols to hire. The pool at the apartment perfect to relax beside or have a gentle swim and quiet., most of the time only us were using it. We absolutely loved this Apartment, very spacious, clean and well equipped. The complex was nice and quiet and most days we had the pool to ourselves, it was very relaxing. There was nice bars and restaurants a walk away, but if you wanted something more livelier it was only a taxi journey away into Alberfuria old town where there was lots of restaurants , bars and street entertainers. Owners Tracey & Ralph were very helpful with our booking and Simon & Marie who looked after the apartment were lovely. Would definetly recommend this to family and friends. Stayed (for the second time) at Tracey's place with my wife and 2 year old daughter. Previously my parents came along. Fantastic villa in lovely grounds in a nice quiet area, but in walking distance to shops, beaches etc. We had a car, which was useful, but you could probably manage without. The property is managed by Tracey's brother Simon, who along with Tracey, is ultra helpful and friendly. Would definitely recommend for young families or people looking for a quiet getaway. This was our third stay here, and again, we were not disappointed. It's clean, spacious, in a quiet location yet close enough to the town, supermarkets, some great local restaurants and only short walk from the beach. Most days we had the pool to ourselves. Made thorough use of the built-in barbecue, the local supermarket has excellent fresh meat and fish, not to mention fab award winning local wines all at very reasonable prices - provision of a dishwasher and well equipped kitchen makes self-catering a breeze! Balaia Residence is situated on the coast. There are two beautiful beaches within walking distance. The nearest is St Eulalia and is a 10 minute walk, here you will find restaurants, bars, sun bed hire and water sports. The nearest airport is Faro, and is approx 30 minutes drive. Car hire is not essential but would be recommended to get the most out of your holiday. We can arrange transfers to and from the airport if required. Albufeira New Town is approx 20 mins walk, of the bus stop is a 2 min walk. A taxi costs just under 7 euros, from there you can catch the shuttle bus into the old town. Here you will find many shops, bars, restaurants and a lively nightlife. 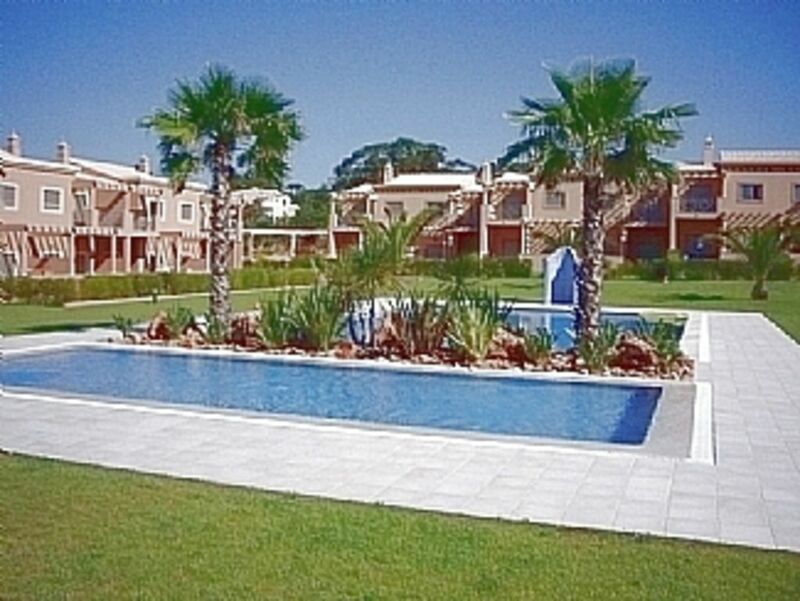 Vilamoura Marina is approx 10 mins drive away. There are many shops, supermarkets, bars and restaurants nearby. Also the 5 star spa resort is only an 8 minute walk away, this is a beautiful resort where non guests are welcome for spa/beauty treatments, drinks and dinner. Booking Notes: A refundable deposit of £250 is required with the final balance payment and will be returned within 48 hours of departure. Prices include all water and power used during your stay. Linen and towels provided, there are also Beach Towels for you to use. Changeover Day: Change over day is normally Saturdays in high season, although we are flexible. Check in from 2pm and check out is 10am although we will be flexible if possible. Notes on prices: Prices are for the property per week in UK Pounds. Short term bookings are available off peak (min 3 nights). Price supplied on request.